This is our second episode on the Brusilov Offensive of 1916. Last week we discussed the vents of early 1916 in the Russian Army and their situation coming into the year before looking at the disaster that was the attack at Lake Naroch. This week we will continue to move towards the start of the attack by discussing the problems that Brusilov identified as well as his proposed solutions. We will then look at some of the details of the plan for the upcoming attack. After spending so much time discussing the situation in the Russian army, it seems only appropriate that we also spend some time with the Austrian Army. So that is how we will spend the majority of this episode before we close out by talking about the run up immediately prior to the beginning of the artillery bombardment on June the 4th. We will also of course look at what the Austrians and Germans knew about the upcoming attack. One thing that I want to throw out here, right at the beginning while I hope everyone is still paying attention. Keep in mind that while I, and most history books, discuss the ideas, thoughts, and plans that would coalesce into the Brusilov Offensive, like any great general he had a litany of amazing people on his staff that made it all possible. The core group of staff officers on the Southwest Front was top notch, and many would go on to play important roles in the Red Army after the war. For the rest of these episodes I will almost invariably be discussing Brusilov and his staff but being shortening it to just Brusilov. Let's start this episode talking about the problems facing the Russians, and really everybody on a strategic level in 1916, but focusing on how the Russians saw things. There were really two problems involved, the first was the act of breaking through the enemy lines and the second was exploiting that breakthrough into meaningful gains. Up to this point, everybody had come to the conclusion that it took a huge concentration of artillery to achieve a breakthrough. This was something that everybody in the war had decided was correct, more and more artillery, more and more shells. The Russians were following suit on this, and they believed that they needed an incredible number of shells to break through even a small piece of the German wire. This was problematic on the Western Front but the Entente could stockpile massive quantities of shells, for the Russians this was not always possible. As the Germans and Austrians continued to improve their lines, and also the amount of wire in front of them the Russians were left in a tough spot. Most generals took what they saw as the only course of action and counted the number of shells that they had and then only fired them on a narrow front. The concentration of shells was the key, and they did not want to spread their efforts over too wide of an area. This led to another problem though, these generals were also attacking on a reasonably wide front, but they were only using their artillery on a fraction of it. We saw this last week at Lake Naroch where one general was forced to put all of his artillery eggs into one basket, and that basket was just a few kilometers wide, even though his divisions were attacking on a much wider front. This was a standard practice for Russian generals coming out of 1916. This helped the Russians achieve the first phase, the breakthrough on that small area of the front, but it did nothing to help them with exploiting it. Just like at Lake Naroch the groups of soldiers who did manage to follow these artillery concentration were generally not joined by the men to their left and right and therefore would find themselves being the sole concentration of enemy artillery and machine gun fire, generally from three different sides. The final problem that this practice caused was that it clearly telegraphed to the enemy where the Russians were going to attack, they might as well have handed over their maps with a big sticky note that said "Hey! We are going to be attacking right here! Not here, or here so much, right here." These were just some of the problems that Brusilov was trying to solved. After discussing all of this information Brusilov came to the conclusion that he had to attack on a wide front. Which seems obvious when I say it, but was fare easier said than done and it forced a significant number of trade-offs. It would require a huge amount of preparation, but interestingly enough, it would also aid in achieving some sense of surprise. If the Russians were preparing on a front wide enough, they could confuse the enemy into not knowing exactly where the attack, or at least the strongest area of the attack, would fall. Brusilov believed that each army would need to mount an attack on at least 30 kilometers of front, and hopefully even more, and then multiple of these attacks would be arranged along the front to just completely overwhelm the enemy. First it would overwhelm them with information, making it easier to appear that the Russians were going to attack everywhere, and then it would overwhelm the enemy with men, which was always the easy part for the Russians. Not only did this make the defender's job harder initially but it also made it far more difficult for the defenders to counter attack if they needed to. This was a problem that everybody was having so many issues solving on the Western Front, when the attackers can only break through on a small area it can be very easy for the defender to counter attack against that and stop the breakthrough. Personal anecdote time. I have a very good memory of a very specific scene in the book Red Storm Rising by Tom Clancy, this was one of those books about the Cold War going hot and starting World War 3. In this book after the Red Army fails in their initial attack two Russian generals are having a discussion about what they should do next. And here is how it relates to the current topic. During this discussion one of the generals suggests a powerful attack on a small front and the other general, who happens to be the superior one, just exploded and goes on a tirade to explain that an attack on a single axis also allows a counter attack on a single axis, the only way to breakthrough was to attack on multiple axises so there would be no hope of the enemy sealing off the breach. I am not entirely sure why that specific conversation sticks so perfectly in my mind, but it does, but we should probably get back to 1916, you know, the reason this podcast episode exists. This strategic plan, attacking on a huge front, was also accompanied by a wide series of tactical reforms for Brusilov's troops. Many of these changes will be very familiar to anybody who has been listening to this show all along, especially if you have listened to the episodes on Verdun recently. The Russians would now begin to put some focus on digging sapping trenches out into No Man's Land to reduce the area between the trenches. This is something that the Russians had not put a big emphasis on before even though in some areas the lines were up to a mile apart. This wide of an area caused problems initially in any attack, making the troops vulnerable to Austrian and German artillery fire, but it also made resupply and reinforcement of those first groups of soldiers next to impossible. Brusilov would also instruct his artillery to use what the Germans would call trommelfeuer, or drum fire, which was just a highly concentrated bombardment right before the attackers hit the defender's trenches. This coordination was key to making the artillery as impactful as possible, but it would also be short, none of the week long bombardments that were happening on the Western Front. Behind this artillery there would come 4 waves of attacking infantry, each with their own specific objectives. Just a small point of clarification, when I say waves here, I don't mean a bunch of lines of men walking across the battlefield. Generally each wave would be made up of a bunch of small units that would rush across no man's land as fast as possible and in whatever way they could. The first and second waves, which would be launched reasonably close together, were well equipped with hand grenades and other short range weapons. Their goal was to rapidly push through the front lines, passing by any really sticky strong points, leaving them isolated for later mopping up units. The third wave would be the heaviest armed, bringing forward machine guns to secure the gains made by the earlier waves. Finally, the fourth wave would attempt to widen and deepen the breach, while also cleaning up anything that had been left behind by the earlier sets of attackers. This method of sending forward multiple waves of men, and more importantly trying to quickly bypass strongpoints to continue forward, would be the tactic used more famously by the Germans in the spring of 1918. If I said the word Storm Trooper, it might conjure some kind of image in your head, maybe of the Germans in 1918, maybe of Star Wars, but this was the origin of the tactics that would make those troopers famous. Norman Stone, in Easter Front, would say that what the Russians essentially did was skip from 1915 tactics that were evident at Lake Naroch, to 1918 tactics evident under Brusilov. However, they did not have to go through the step of the War of Material that was happening on the Western Front at the Somme and Verdun in 1916. All of these tactical innovations probably would not have made any difference if it was not for how wide of a front they were being used on, it was both things put together that made the attack a success. But, all of this was not without some drawbacks through. The biggest of these was simply that as the Russians spread their strength of their enemies over a wide area, they were also spreading their own. This would perhaps help increase the probability of initial success, but would actually make it more difficult to continue to push forward afterwards. It would be very difficult to sufficiently concentrate reserves at one area of the front after having to have them spread so widely to both not tip off the enemy, but also because commanders would not know precisely where they would want to commit their reserves. It also made preparing for the continuation of the attack on a longer timeframe more challenging as well, since it required so much of the Russian strength to be committed in the initial assaults. Almost every available man would end up being committed, with very few in reserve, and this could result in the Russians simply running out of the ability to continue to attack, even if the initial stages went perfectly. It should be obvious that Brusilov had some ideas, but just as important as having ideas, is how they are put into practice. Under his command he had 4 armies, which included 40 infantry divisions and 15 cavalry divisions, although the cavalry would not end up playing much of a role in the fighting. These armies were arranged on the front from north to south as the 8th, 11th, 7th, and 9th armies and they occupied a front that was 300 km wide. As I mentioned earlier the attack would not occur along this entire 300 kilometers, at least initially, instead each of the armies would chose roughly 30 kilometers of their front that was most suitable for an attack and focus their efforts there. For reference, the Somme, the largest attack in the West in 1916 also spanned about 30 kilometers, but there was only one of them, not 4. It is really hard to keep track off all of the things that were happening on this kind of scale, and it presents an interesting problem for me while trying to tell you about it. Because of this, once the battle starts we will probably focus on just a few of the areas of the fighting, it is just too dang big. This massive endeavor required an equally massive amount of time and resources. Most of the time was spent on getting the troops trained for what was expected of them as well as preparing the battlefield. This preparation had to begin right at the top with many commanders under Brusilov, lets say less than convinced about the new plans. It went against probably a thousand years of military tradition to spread the army so thin, and to leave so few troops in reserve. As an example, one of the armies, would be able to keep only one infantry division in reserve on their area of the front, 1 division for 75 kilometers of front, it was basically nothing. This was a scary proposition, and if things went poorly it could result in disaster. Brusilov also received resistance from above. Alexeyev, after receiving the detailed information about what was being planned started to get very concerned that Brusilov was going to cause some sort of massive disaster on the Russian southern front. This caused him to pressure Brusilov into changing his plan, to narrow the front, but Brusilov refused. The planning and preparations for the attack had already required a huge amount of work from the troops, primarily in digging new trenches out into no man's land and to accomplish this feat almost every man in the area had been used for months before the attack. Hundreds of thousands of cubic meters of earth were dug up and turned into reasonably solid trenches. These massive preparations were impossible to hide from the enemy, the Germans and Austrians, but were in a position to resist what was about to happen? It has been awhile since we have discussed anything about Austria-Hungary on the Russian Front. When we last left them they were running high off of a string of victories in the last half of 1915 after forcing the retreat of the Russians from Poland, finally capturing all of Serbia, and then the successful defense on the Italian Front. After the advances on the Russian front in the middle of 1915 the front had been de-emphasized and it was unlikely that more attacks would be launched on that front anytime soon. Because of this the Austrian and Germans troops on that front had been putting a lot of focus on making their front like far more difficult for the Russians to attack. This meant a lot of digging and a lot of construction. I am just going to hand it off to Timothy Dowling from his book entitled simply Brusilov's Offensive for a description of the Austro-Hungarian positions. "Austro-Hungarian troops consisted of three positions comprising three lines each. Each line was to be not less than fifty but not more than 100 meters distant from the other, in order to provide a "firing gap" for the Habsburg machine guns and artillery. The bulk of the infantry strength was to be located in the rearward positions, where huge, concrete-reinforced dugouts provided shelter from enemy artillery. Field artillery, the so-called Sturmabwehrartillerie, was to be placed directly behind the first line, not further than 3,000 meters from the enemy trenches. Some artillery was placed as close as 300 meters behind the first trench. The trenches in the forward line were deep, were topped by earthen berms, and contained concrete-reinforced positions designed for machine guns to provide enfilading fire, as well as timbered dugouts for the forward observers. "They were," according to one observer, "beautifully constructed of great timbers, concrete and earth. In some places, even steel rails had been cemented into place as protection against shell fire. "47 Ahead of these positions were two or, more often, three strips of barbed-wire obstacles, with each strip being 6-10 meters deep." All of this construction was good, and it did give them an increased ability to defend their line, however it did not solve all of their problems. The biggest problem that they had was that so much of the Austrian defense ability was right on the front lines, in those first three positions. Beyond this there was nothing to stop the enemy except for some plans on drawing boards at staff headquarters that had not even been started by June 1916. To man these trenches the Austrians and Germans were able to field very capable soldiers, and enough of them. The Austrians were starting to scrape the bottom of the barrel in terms of manpower but they were able to make good their loses from 1915, if only barely. These troops were well supplied and generally had high morale. This high morale was caused in no small part because of the fact that they felt that they were far superior to the Russians that they were facing. In some ways this goes against the typical image of Austrian troops during the war, that they were downtrodden masses of poorly trained, poorly equipped, and poorly motivated troops of a country they hated. This was not the case in 1916, and in fact by many measures the troops that the Russians would meet in this attack were some of the best motivated Austrian troops of the war, maybe behind the troops on the Italian front who were fueled by their hatred of Italy, but still heavily motivated to defend against the Russian troops who they saw as inferior. This feeling was also backed up by material gains for the Austrian army, with artillery and overall firepower greatly increasing in the first half of 1916 with some units having 50% more artillery in June than they possessed at the beginning of the year. These were real changes that could have made the Austrian army facing the Russians far more formidable. However, the generals in some ways trusted their guns and their defenses too much, and put so much faith in their defensive lines that the troops did not get critical training on how to properly defend them. The men spent a lot of time digging and constructing positions but not much time practicing for what they would do in those positions once the fighting started. Earlier I mentioned that the Austrian soldiers on the front lines believed that they were superior to the Russians facing them, and this gave them confidence. However, this feeling of superiority percolated through the entire Austrian and German chains of command. They believed that they were simply head and shoulders better than the Russians, and the huge successes of 1915 had just fortified this belief. This belief would play into how they approached the offensive that they thought might be coming. Much of the Austro-German defensive strategy against Russia was built upon the fact that they believed that at any area where they wished to attack the Russians would have to shift a huge number of troops and resources, this would then telegraph their intentions weeks if not months in advance. They also believed that the Russians were incapable of innovating their attacking strategy in any meaningful way. This was a gross underestimation of the Russian commanders but also an indictment of the men under their command, who they believed were incapable of performing anything but the simplest of orders. To be fair, there were also Russian commanders who believed that this was the case. All of this was distilled into a publication that was sent out to the Austrian armies entitled "The Experiences from the Russian March 1916 Offensive Against the German 10th Army" which discussed the events at Lake Naroch and the lessons that could be learned from the attack. This report would conclude that the Russians would have absolutely no problem in dealing with any Russian attack, in fact it would be easy. One general would report to Conrad around this in reference to the Russians that "they attack quite stupidly in thick masses, and they can't possible succeed this time." This feeling of superiority was not just limited to the Austrians, the Germans felt the same way, probably even moreso. General Linsingen, the primary German commander that would take part in the early fighting, would say that the defenses would automatically hold. All of this confidence meant that when the attack came the Germans and Austrians were far less prepared than they should have been. Both had robbed the Eastern Front of men and resources for attack elsewhere, for the Germans it was Verdun and for the Austrians it was Italy, these attacks coupled with the crisis caused by the Brusilov offensive would end up pushing them to the edge. This created a situation where both the Austrian and German armies had to be on the same page, however, as we have discussed since the beginning of the war this would not be the case. From the German side they continued to have doubts about the abilities of the Austrians, and were in general just tired of feeling like they had to constantly prop up their ally. On the Austrian side they were angry that the Germans were always trying to control everything. This situation would only intensify after the German General Mackenson had led the campaign that had finally taken care of the Serbian problem. Sure, he had been in command of a lot of Austrian troops, but he was not an Austrian, he was a German, and he had led the troops to victory. This disconnect and resentment between the two countries would just be intensified when the pressure mounted after the Russian attack. Both of them were at fault for the situation, the Germans had taken 20 divisions from the Austrian front since 1915, the Austrians themselves had taken the equivalent of 6 for the Italian attack. When the attack started Conrad would quickly begin requesting that Falkenhayn send more troops while Falkenhayn would insist that if he were to do so the Austrians would need to stop attacking in Italy and bring those troops back. Both sides were having problems budging and coming to an agreement of any kind, that is how poisoned the relationship between the two was. Alexander Watson in Ring of Steel would say that "Falkenhayn and Conrad’s failure to agree was spectacularly irresponsible, for the Central Powers’ fates were bound together and their enemies were gathering overwhelming strength against them. With their attention focused on the Western and South-Western Fronts, the eastern theatre was disastrously neglected." I have mentioned the Italian front situation many times in the last two episodes, so I think it is best to give just a brief overview of what was happening there. We will have a far more detailed look at the situation in later episodes, but the two situation interact so completely that it is worth taking a few minutes to give a brief overview here. Basically, Conrad really wanted to attack Italy in 1916, like really really wanted. A combination of this desire and the underestimation of Russian potential resulted in the planning and execution of the Trentino Campaign, or the Asiago Offensive as some histories call it. 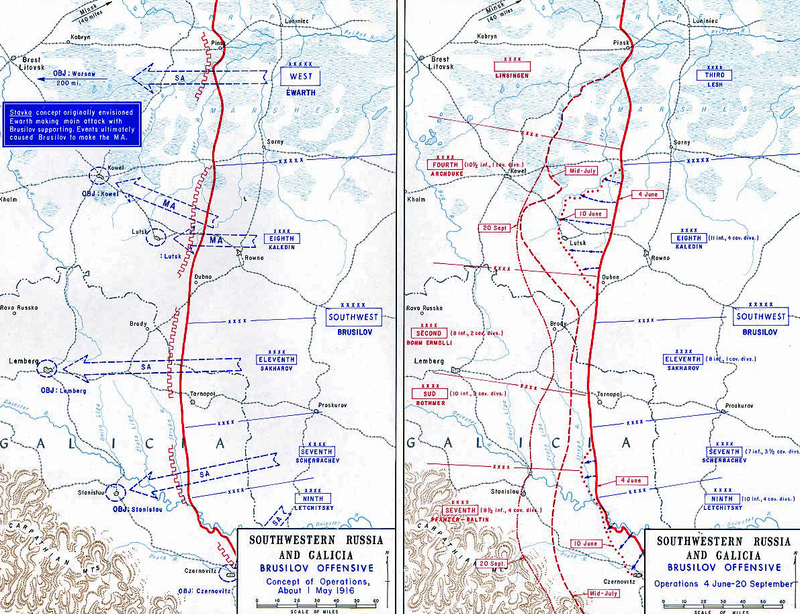 This attack was launched not on the Isonzo front where most of the fighting so far had happened but instead further to the west where the Italians were not as prepared. Conrad was able to concentrate 157,000 troops, which was not a huge amount more than the Italians had. When these troops were launched forward their initial gains were good, not up to expectations but good, and it also rapidly began to bog down. This is obviously an amazing simplification but enough to allow us to talk about how it affected the Russian front. Previously I said that Conrad sent the equivalent of 6 divisions from the Russian front to Italy, you may note that I did not necessarily say entire divisions. In fact Conrad's shift in troops did not necessarily affect the order of battle as much as it drained the fighting power of the Austrian troops in less obvious ways. The first was that the quality of the troops sent to the Russian front as replacements was less than what was being sent to Italy. Conrad also robbed some of the best units from the Easter Front, which replacing them with men of lower quality and more importantly less experience. There were also instances where Conrad would take just single battalions here and there to send them to Italy, sometimes without replacing them. This created a situation where the order of battle for the Austrians did not seem to change much, but they were much weaker. The other area that was affected was in heavy artillery. Most of these large pieces were moved to the Italian front, robbing those facing the Russians of their best tool to hit back at the Russians once the attack started. Sure they had a large number of smaller guns, but these were simply not enough when it came to hitting troops in defensive positions. The third and largest problem that Conrad forced upon himself was that he critically drained his strategic reserves and when Brusilov attacked Conrad's ability to react was almost non-existent. This would put him in a position where he would have to choose to either stop the attack in Italy or lose massive tracts of territory to the Russians. The attack against Italy was not completely bad for the Austrians through, it caused the Italians to reach out to Russia and ask them for assistance. Because of this request Brusilov told Alexeyev that he could move up the launch date of his offensive to June the 1st. Almost immediately after this decision it was postponed to June the 4th, not because Brusilov wanted to delay it but because Event, who was still going to be attacking in the north would not be ready until that date. After this delay Brusilov was adamant that the delay to the 4th was the last one that he could possibly allow, even if it meant attacking without Evert's assistance. Alexeyev's belief in Brusilov's upcoming attack continued to decline as the date drew closer, and exemplified perfectly by what happened on the third of June. In the evening he called Brusilov and told him, on behalf of the Czar himself, that Brusilov should postpone the attack until a late date, a much later date. Not deterred by this request, or from the attachment of the Czar's name to it, Brusilov said that if he was not allowed to launch the attack on the 4th he would simply resign. The basis for this insistence was that any further delay would undermine the men's confidence in themselves. At his disposal Brusilov had over 600,000 men, and this force would be facing around 500,000 Germans and Austrians. The Russians would have over 1,700 light artillery pieces and 168 heavy ones. Trying to coordinate this large number of men and guns caused some last minute headaches for the Russian leaders. With the communication technologies available to the Russians at this time trying to coordinate over such vast distances was quite difficult and it meant that there was some confusion behind the lines leading up to the attack. Some reinforcements did not arrive to their proper destinations at the right time, some did not arrive all, some arrived at completely the wrong area. There are also stories of some divisions spending the last few days before the attack marching back and forth behind the line, trying to get into the proper positions. These types of confusions were almost unavoidable, and did not really drastically change the outcome, however, if things had been more organized the attack may have went better. Overall the men who were going to go into the attack on June the 4th were prepared and confident in what was about to happen. A critical component of all of these attacks is what precisely the defenders knew about what was coming. In this case there are few instances in the war of a defender being more aware of what was going to happen than the Germans and Austrians before June the 4th. All the way back in March German officers began to report an increase in the number of Russian aerial reconnaissance flights over the front, and these were just the beginning. During April and May the preparations were extremely apparent with the Russians digging an enormous number of trenches and fortifications out into No Man's Land. This tipped the Austrians and Germans off to a possible attack and so they took what they thought were reasonable actions, they shifted some reserves around to cover the more risky areas and then greatly increased their patrol activity. The one thing that they did not often do was use their artillery to try and interdict the activities that were happening in front of them. Even as late as June the 2nd this was still not being done, with one commander noting that it was not because he did not want to, but instead because he simply did not have the ammunition. The plan was also found out from Russian deserters and prisoners that were taken in the days and weeks before the attack. From the German end this had all of the hallmarks of an attack, at least at some point in the future, however it was lacking the one telltale saign that the Russians were about to attack, a massive amount of troops being moved into the area. This had proceeded all of the other major Russian attacks, as they sought to hit their numerical advantage that they had previously relied upon. In this case Brusilov was not doing that, as we discussed he was only working with the troops that he had, and because of this the German and Austrian leaders were hesitant to believe that an attack was coming soon. There were a few reports here and there of new troops being moved in behind the Russian lines, but nothing in the realm of the hundreds of thousands that they expected and because of all of these things put together, and the belief in their defensive preparations the Germans and Austrians believed that they were more than prepared for anything that could be thrown at them. Of course, they had no idea of how effective the Russian attack was about to be. Join me next episode as the guns begin to fire.